← Automation – For People? We came to bring the first tulips of the year to the people that built our house 150 years ago. The Spencers are almost like old friends to us after so many years of living in a house that, in many ways, still belongs to them. They were founders of the Republican Party and active abolitionists. President Lincoln appointed William A. Spencer clerk of the US District Court in 1863 in return for his loyal service. Up in the attic, the kids all carved their names, including “Charles L. Spencer, Apr. 14 ‘69”- the fourth anniversary of Lincoln’s assassination, then a solemn holiday without school. Memorial Day comes from that time. The hundreds of thousands of graves of soldiers killed in the Civil War seemed to deserve sprucing up once a year as a way to honor their sacrifice. Weeds were cleared, flowers were placed, and a small flag was set to decorate the graves of those who made the ultimate sacrifice. “Decoration Day”, as it became known, apparently started even before the war was over in some places. The time of year was picked simply because the start of summer was when the earth itself was renewing. The first declaration of a national holiday came in 1868. The Grand Army of the Republic, a Union veteran’s organization that maintained a military structure, called on all its members to have a unified Decoration Day on the last Monday of May. They had an enormous amount of political pull, so the celebrations were held across the North were often closely tied with government. It wasn’t until after WWI that the South observed the same Decoration Day. The day and the name “Memorial Day” wasn’t officially recognized by the Federal Government until 1967. But long ago, it was simply Decoration Day, when the weeds were pulled and fresh flowers were placed, and a family reunion of sorts was held with veterans and not all the same. The Spencers, like all the pioneers, lived close together in the small town of Saint Paul, and now spend eternity together in a corner of Oakland Cemetery. The trip under the oaks to see them and give them the first flowers of the season passes just long enough to put some perspective on a visit to the old pioneers who made Saint Paul what it is. Coming to America was obviously a rebirth worthy of note to all of eternity. It made this family what they were as surely as it made Saint Paul what it is. Among these newcomers, the flowers are fresh and the memories are bright and freshly carved. A Styrofoam container with a meal half-eaten sits on one grave, a picnic shared through time as much as hope. Our offering of tulips seems a bit thin, but it’s what we have. It’s not the traditions that makes this holiday. It’s about doing what’s right by those living and dead. We do well to remember those who came before us and what they did to make the world the way it is. A few moments to recall that we are where we now for very good reasons, far too often soaked with blood, does more than help us to appreciate what we have. Their spirit has gotten us through a lot, and it can get us through whatever challenges lie ahead. It’s our turn now, and while we’re not all called on to fight in war we are called on to take our turn and serve and make the world in our own way. Those under the white tombstones are now only stories, all any of us are in the end. Retelling those stories as we freshen up the only physical reminders left keeps us humble but strong. There is redemption for everyone who needs it under the shade of Oakland Cemetery. 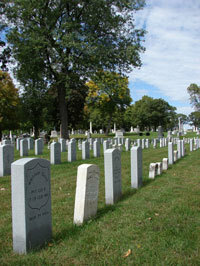 This entry was posted in People & Culture and tagged Memorial Day, Oakland Cemetery, St Paul. Bookmark the permalink. I’ve loved walking this cemetery. Nice post. It is a beautiful place, and worth spending a lot of time in. beautiful piece, love it every year! I will run it every year. We need more of the peace they have in Oakland – especially for the living. Rich in history,beautiful in description!